The Stringam ranch covered a lot of ground. Going out to check the cows was an event. Usually requiring hours. If not a whole day. And prairie weather is—ummm---let’s go with capricious. It sounds a whole lot better than unpredictable. Or just downright volatile. On to my story . 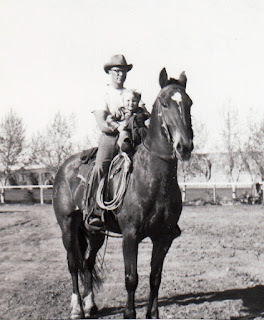 . .
Daddy had gone to ride through the herd, checking that no one was AWOL. Or dead. It was nature, after all. It had been a beautiful day when he left. With no weather channel or satellite imaging, there was no way of knowing that this could change. Dramatically. About five miles from the ranch, a storm blew up. Now you have to know that the prairies are known for their endless stretches of grasses. And notable absence of trees. When a storm starts, it can get a really good run. In a matter of seconds, one can go from happily basking in the winter sunlight to being mercilessly buffeted by cutting winds and blinding snow. Daddy’s world was instantly blotted out. No landmarks. No solar guide. Up and down were even difficult to differentiate. Daddy stopped his horse. There was only one thing left to do. Have you ever heard the phrase: “There are no atheists in foxholes”? Well that would apply equally to ranchers stuck in snowstorms. All at once, he felt the distinct impression to let go of the reins. Yep. Cross them over the horse’s neck and leave them there. I expect you realize that this is a tall order for a rancher. You let go of the reins, you lose control of the situation. Sighing, Daddy did as he felt impressed to do. Then hunkered down in his coat and tried to pretend he was somewhere warm and sunny. The horse started to walk. Occasionally, Daddy would poke his head out to stare at the great featureless wall of snow that hemmed he and his horse on every side. Then, as his mount kept moving, he would slide back into the comparative warmth of his coat and start praying again. All at once, the storm seemed to lessen. Daddy frowned. Yes. There was a definite break in the wind. Daddy poked his head out. They were standing in front of the barn. I believe in answered prayers. And in the Guardian Angels sent to our aid. They appear in all sorts of ways. Sometimes with four legs and a mane and tail. Labels: Prayers can be answered in different ways. It should probably come as no surprise that I love children. And that I had (what I consider) a stellar childhood. I was raised with peace. And a lot of adventure. Today, I'm thinking of those children throughout the world who have none of these things. And my heart breaks for them. In my opinion, children should never have to fear. I offer them my prayers. I keep them in my heart. Today, I'm thinking of them. We depended on our horses on the ranch. They were usually well trained and quiet, something you needed when you worked cattle. 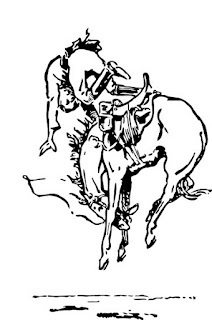 A jumpy horse would rile up said cattle and get them nervous. This made them difficult to handle. They may hurt themselves or just go running in some crazy direction and lose lots of precious weight that Dad had just spent many feed dollars trying to put on their bodies. Because, let’s face the hairy truth: Cows aren’t the geniuses of the ranching community . . . It takes many years to make/train a quiet cattle horse. You start with a colt that is full of lots of energy and you train and train using various techniques to develop a well-behaved horse. Having said all that, somewhere in the training/breaking process, you have to use the ‘green broke’ horse to work cows as part of their schooling. Our family had a friend that I’ll call RG, who was in the middle of one of these young-colt/quiet-horse processes. On a beautiful spring day RG and several members of his ranch crew were taking a large herd of cattle from their ranch headquarters to the spring pasture—a trek that put Dad’s ranch at the half way point. Our friend dropped by earlier in the day and left his green broke colt, planning to trade his well-trained cattle horse for the green horse at the halfway point. This would give the green horse the opportunity to work with cows, but the cows would be tired and quiet and not likely get excited if the horse got a little jumpy. I was up at the barn when our friend rode up to exchange horses. He quickly saddled the green horse and mounted. I guess his horse was not quite ready for any cattle drive because he pulled his head down and started bucking. Now, initially I thought that this wouldn’t be a problem. 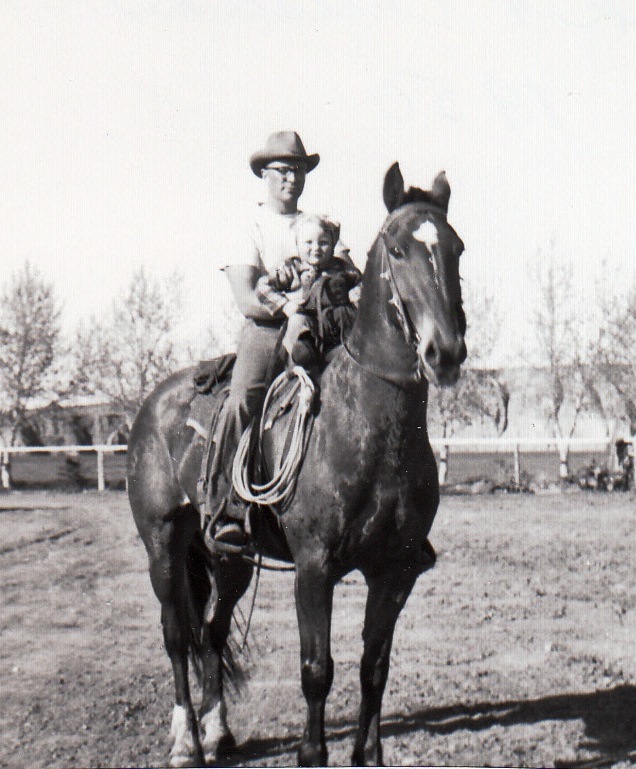 RG was a seasoned cattle rancher and he could manage a green horse. Then I realized that RG was also 75 years old and maybe not as strong as a young rancher. The horse bucked several times. I held my breath. With every hop of the horse a word popped into my head. I hoped and prayed that RG could get things settled before he was piled. And I would have to call an ambulance. But RG couldn’t hold on any longer and the horse piled him good. He groaned and let go of the horse’s reins. My body hurt just seeing him get planted. It seemed for a brief moment that RG was down for the count and I was afraid that my greatest fears had come true. I was about to run over and ask him if he was ok when RG pulled himself up, spun around and grabbed the reins of the horse. He placed his foot in the stirrup and swung into the saddle. It was like a reflex action. I was sure that RG was hurt and would have liked to come into the ranch house for a rest. Once RG was back in the saddle, his horse settled. He said, “I’ll be back later for the other horse.” Then headed down the road after the herd of cattle. I watched anxiously as he rode away, not wanting to see a repeat of the piling episode. I learned something from this: These old ranchers are tougher than my generation. Marlboro man you ain’t got nothin’ on RG! It's fun to see stories of the Stringam Ranch from a different set of eyes. Today's adventure is courtesy of my little brother, Blair. When we were growing up, we all had that friend who was just a bit larger than life. That kid who tried things. Adults loved them. Kids loved them. Bad things never seemed to affect them. They lived a charmed life. And we sidekicks desperately wished we could be the same. 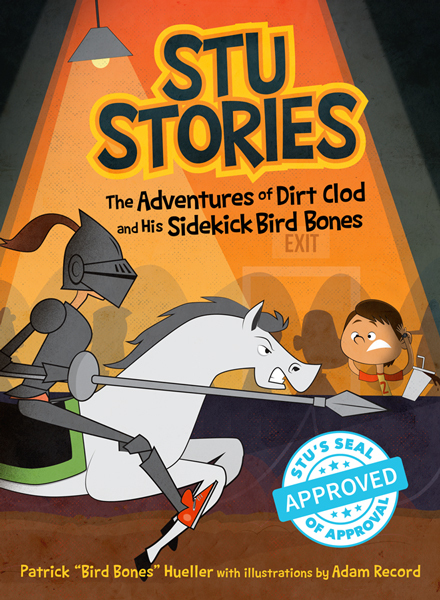 Stu Stories, the Adventures of Dirt Clod and his sidekick Bird Bones is a fun, crazy, highly entertaining series of adventures featuring just such a kid. Stu Sanderson, alias Dirt Clod. Who, on his way to becoming an eighth-grade legend, challenges knights, does magic, kidnaps the teacher’s marker box, reads minds, disappears in the middle of class . . .
And never uses a door to enter his home. Even when life goes horribly, terribly wrong, Stu never loses his charm. Or his sense of humour. I want to be just like Stu. 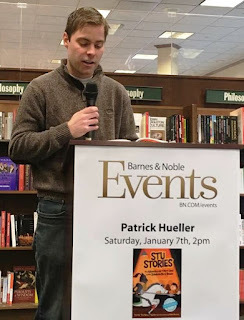 Patrick Hueller has an MFA in Creative Writing from the University of Minnesota. His fiction and humor have been published fairly widely (sometimes under the pen names “Paul Hoblin” or “P.W. Hueller”). 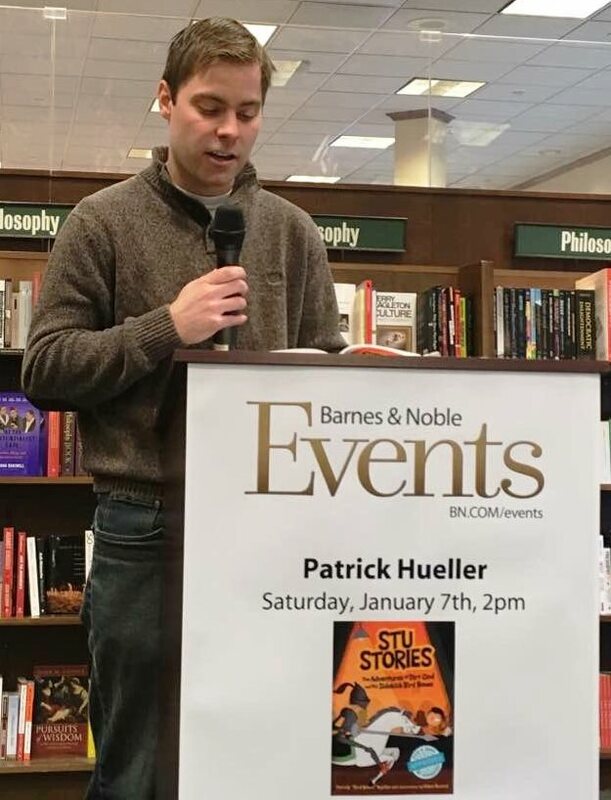 Fun fact: he’s Cedar Fort author Andy Hueller’s identical twin brother. They like to do readings together whenever they can. He’s been a middle school teacher and is currently a college English professor at Hamline University. 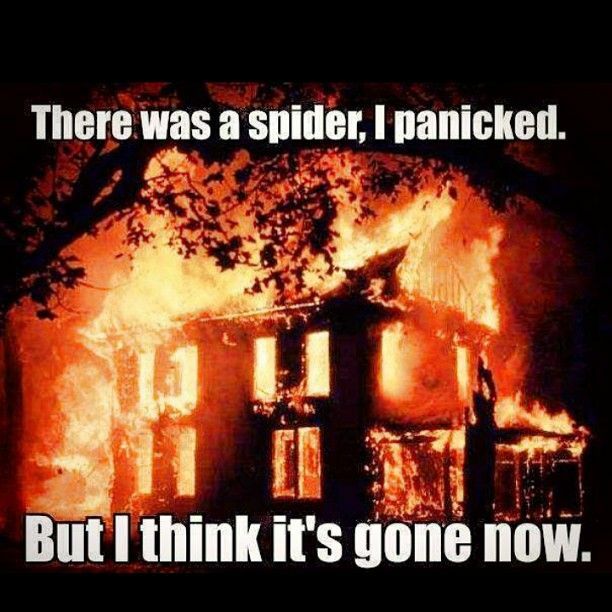 Spiders and I get along very well. As long as there is space between us. Lots and lots of space. When I can see them ‘over there’. And I’m quite sure when they can see me ‘equally over there’. Perhaps we could call it a mutual respect? Reverence? Esteem? Nope, I think ‘aversion’ fits in here quite well . . . When I was in grade seven, my seat was the last in the row next to the windows. As far from the teacher as I could be and still be considered ‘in’ the class. On this sunny day, a large spider had been happily parked in his web high up in the window closest to my desk. For a reason known only to his tiny little spider brain, he decided it was time to leave said window, travel down the wall and begin a journey across the floor. Now, up to this point, my eyes had been glued to the little eight-legged cretin. That whole ‘over there’ scenario (see above). But just as he reached the floor and started to cross between me and the student in front of me, the teacher asked me a question. You’ve been ignoring me this whole morning and you ask a question now?! It was a dilemma. Fear of the teacher vs fear of the spider. Hmmm . . . that’s a toughie. I decided on the half-way approach. One eye on each. I gave a bit too much attention to the teacher and lost sight of my busy little friend. Partway through my answer, something touched my leg. My brain equated said touch as ATTACK OF THE DEADLY SPIDER!!! EVERY MAN (or woman) FOR THEMSELVES!!! I leaped up out of my chair and did a week’s worth of cardio in only four seconds, to the amusement of my fellow students and astonishment of the teacher. Finally, seeing no spider, I returned to my senses. 1. My impromptu tarantella flung the little monster to the far side of the sun. 2. He was never on my leg. Which also raises the question: What—or who—touched me? Which do you choose? And what scares you? P.S. I also have a little ceremony in which I shake out my shoes before putting them on. You never know where those sneaky little beggers will be hiding. There is a lot of 'stuff' going on in the world. You won't find any of it here. I want this blog to be a little oasis of peace and good humour. It's time for 'Poetry Monday' again! Let's face it, Mondays need the help! He would be known as man’s best friend and serve the best he can. He’d eat whate’er they gave him and live twenty years. Plus five. Now Father thought He’d have some fun and so the monkey made. Who’d jump around from branch to branch there in the jungle glade. He’d silly act and silly walk and live twenty silly years. And then when he’d made the others, Father finally got to man. The two shook hands, their bargain made, and still it stands today. And lives his thirty ‘donkey’s years—his daily bread he earns. He spends his fifteen ‘doggie’s’ years, just thinking he’s in heaven. To silly be. And playing like his hair's been set afire. This time’s the best of all, he spending it with his grandkids! Me. 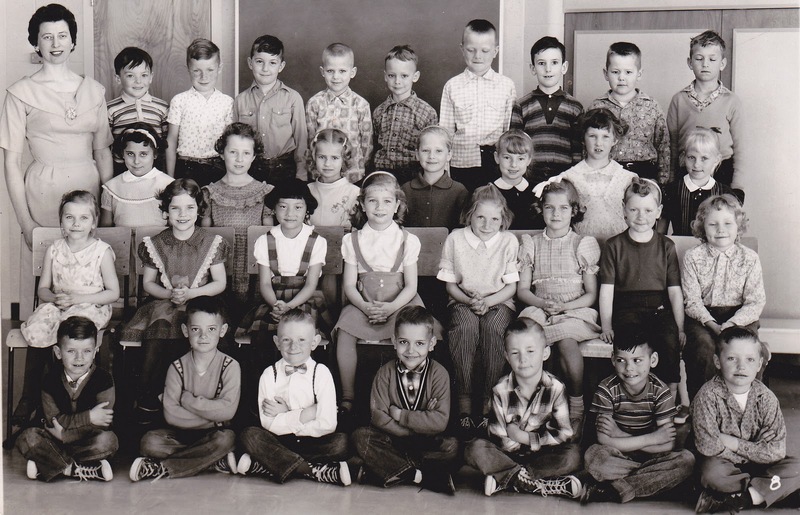 Far right, second row. Renee, directly behind me. One of us was perfectly dressed. I have repented . . It was my first day of school. I was breathlessly, happily, finally in grade one. I had just enjoyed my first bus ride. It was bumpy and dusty. I had been duly delivered to the sidewalk outside my brand new school. Where I stood in indecision. Okay. The other kids were lining up at the doors. A tall, slender woman was calling for all of the "Grade Ones!" I saw several kids about my size line up beside her. The bell rang and Miss Warnoski turned and went into the school. In Miss Warnoski's room, we toted our book bags (mine was homemade by my Mom) to our first desk. I was in the second row. It had my name pasted onto it. D-i-a-n-e S-t-r-i-n-g-a-m. I spelled it out by tracing with a finger. I watched to see what the other kids were doing. Okay. I could do that. I began to pull out thick, red pencils and half-lined scribblers. Cool. There was a cubbyhole under the desktop that could hold a mountain of stuff. Soon it was home to my stuff. I hung my bag over the seat back, sat down at my desk, folded my hands together on top, and let my legs swing. Miss Warnoski began to teach. Okay, not such a breeze. Then, it was time to line up for Recess. We filed back outside. And kids began to run and play. Pffff. What was I worried about? This was just like playing with kids at home. In fact, I recognized some of the kids from playing at home. Suddenly I was in my element. And that's when the trouble started. I should point out, here, that I didn't always get into trouble during recess. It just seems like it. There was a tall, very slender girl in my new class. She had long, silky, platinum-blond hair, perfectly groomed. And she was dressed in the very pinnacle of fashion. Something that would remain a trademark with her throughout our school years. And something that would pass me by throughout . . . you get the picture. Today, she had on a poofy pink dress. Which I secretly thought was very pretty. And of which two or three of the other kids were making fun. They called out jeers and snide remarks. A five-year-old's version of insulting. And none of which I can remember. But it looked like fun! "Renee, you look like a big, poofy candy floss!" Renee just smiled. As she had been doing all along. And suddenly, I didn't feel all that clever. In fact, I felt stupid. I had made fun of someone. And I didn't like it. I handled my new feelings of embarrassment and chagrin with aplomb and maturity. Till the bell rang and Miss Warnoski came to gather all of us. I've forgotten much of what I was taught in grade one, I'm sure, but one thing stayed with me. Don't say anything you wouldn't want said to you. Okay, I never had to worry about anyone teasing me about my 'candy floss' dress. Or any dress for that matter.